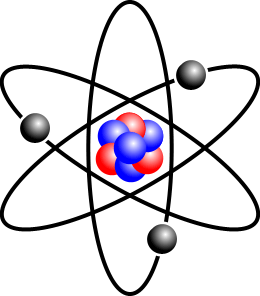 An atom consists of a nucleus at the centre and electrons moving around it. The nucleus contains a mixture of protons and neutrons. For most purposes in chemistry, the two most important properties about these 3 types of particles are their masses and charges. In terms of charge, protons are positive, electrons are negative, and neutrons are neutral. A proton’s mass is roughly the same as a neutron’s mass, but a proton is almost 2,000 times heavier than an electron. This image shows a lithium atom, which has 3 electrons, 3 protons, and 4 neutrons.